Duration : 2 - 4 hours. a basic overview of the Laws of the game. Duration : 12 - 16 hours. the Laws of Cricket. Apart from covering the key Laws in detail, it also deals with the basic techniques of match-management. between the knowledge-based Level 1 course and the field-craft and techniques based Level 2 course. Participants must be ECB ACO Members and have successfully completed the Level 1 Course. The course consists of six modules and is designed for any experienced official who aspires to stand in a higher grade of cricket. personal, match and man-management, fieldcraft, positioning and technique. Umpiring complete with self-appraisals and be independently Assessed on at least tw occasions. 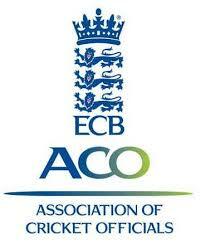 Participants must be ECB ACO Members and have successfully completed the Level 1A Course. Duration 12 - 16 hours. Consisting of six modules designed for those that wish to sore matches regularly, the course covers the basics such as scoring symbols, Umpire signals and completion of the 10 parts of the scoring record or book, as well as giving a helpful overview of the Laws of Cricket. Successful completion of the course will require a 'scorer assessment' which involves scoring a match and verbally demonstrating an understanding of the role. Open to any ECB ACO Member that has completed the ECB ACO Level 1 Scorer Course, Level 1A is attained by the successful recording of 10 matches, rather than being a taught course. In addition to keeping a record of the matches scored the participant will be required to pass an Observation and brief Verbal examination with a Level 2 Scorer to complete the Assessment. Consisting of six modules, the course is designed for any experienced Scorer that wishes to refresh and/or hone their skills. More advanced areas of Scoring, including : Interpretation of Law, alternative Scoring methods, working alongside colleagues, statistics and the differing Rules and regulations are covered.